Earlier, Beloved and I had dinner at Lamesa Grill in SM North EDSA. It’s kinda funny why we ended up here. Beloved was craving for soup, so we first started going towards Yoshinoya. While at the Sky Garden, we passed by Marina, and beloved started craving for sisig. We almost decided to eat there, but I thought it was weird to eat at a seafood grill and then order pork sisig. 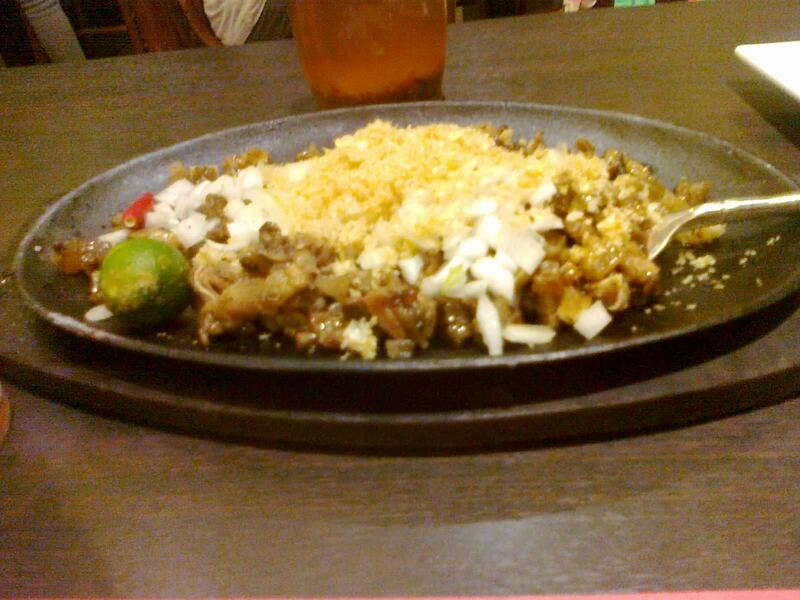 We ended up going to the next Filipino resto that served sisig, which was Lamesa Grill from the path we took. Do note that there are many bar-and-grills at Sky Garden that specialize in Filipino food, and Lamesa Grill is just one of them. Beloved said that Lamesa Grill is the same as Mesa, except this one specializes in the grilled stuff and is a bit cheaper. I do notice that they also have the “boneless crispy pata” in their menu, which I thought was pretty unique when I first saw it, so I guess this sort of confirms what she said. Aside from that, the rest of their menu is similar, but there’s noticeably a lot more grilled stuff from seafood to meat. Of course, other Pinoy favorites that goes well with beer are present including sisig, so we ordered that—Pork Sisig for 170 Php. Learning from the past Filipino restaurant experience, we decided to go for variety and ordered a healthy plate of Adobong Kangkong with Garlic for 115 Php. To add variety, we also ordered a special rice—their Seafood Rice for 150 Php. Finally, because we weren’t drinkers, we asked for a couple of glasses of their Bottomless Iced Tea priced at 65 Php which was nothing special, but I guess reasonably priced. It was really a short wait, and all our food came at once. The sisig was not really plentiful, but there’s noticeably a lot of meat in it. It was pretty plain—just minced pork parts, onions, and chicharon without any sauce whatsoever. I forgot to ask them to put an egg in, which would’ve costed an additional 10 Php, but I guess it’s okay. I must say the onions overpowered the pork by a bit even after mixing in the calamansi. Then again, I usually eat sisig for its crunchy-bitty-crispy texture that I like, so it gets passing marks from me overall. 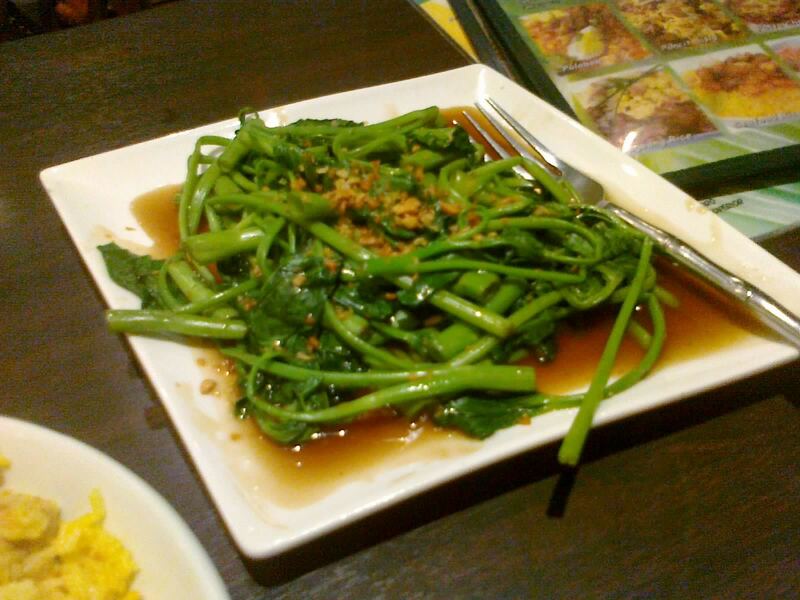 Now, this one, the Adobong Kangkong, gets much higher marks. Its semi-sweet, garlicky sauce combined with the crunchy-watery leaves and stalks made the dish a wonderful treat. There’s also a lot of it in there, so there’s really no complaints in this plate whatsoever. Heck, I could eat this alone with rice. Speaking of the rice, well, it was much more appealing in the menu picture, having a lot of seafood on top. The server mixed it all up before putting it on our table, so the seafood bits aren’t visible—not that there was a lot of them. When you do get some of the seafood bits, you get that slightly salty taste of whatever seafood it is. 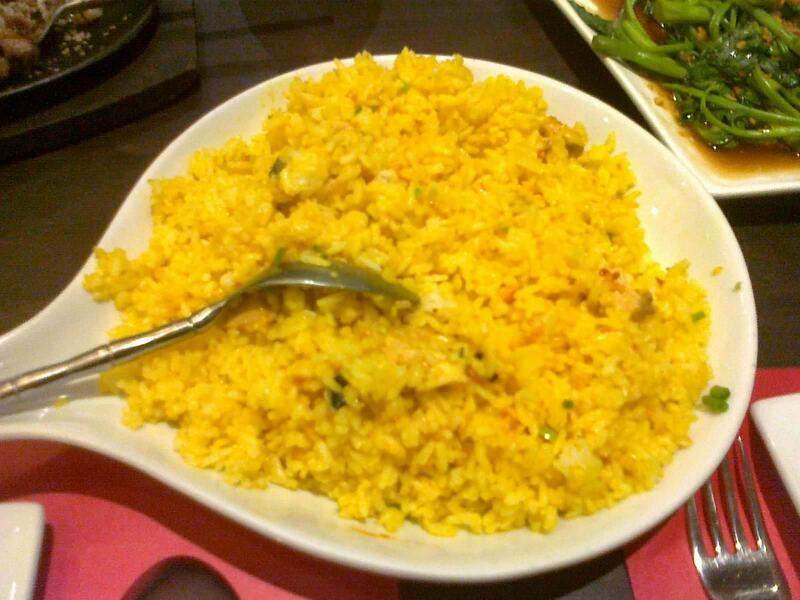 But the rice itself, although yellow, tasted pretty normal—bland and starchy. There’s a lot of it, though; good enough for three. Because we still had a lot of rice and only a spoonful of sisig left, we ordered another viand that struck me interesting when I saw it. We got a plate of their Inihaw na Liempo cooked The Lamesa Way for 150 Php. 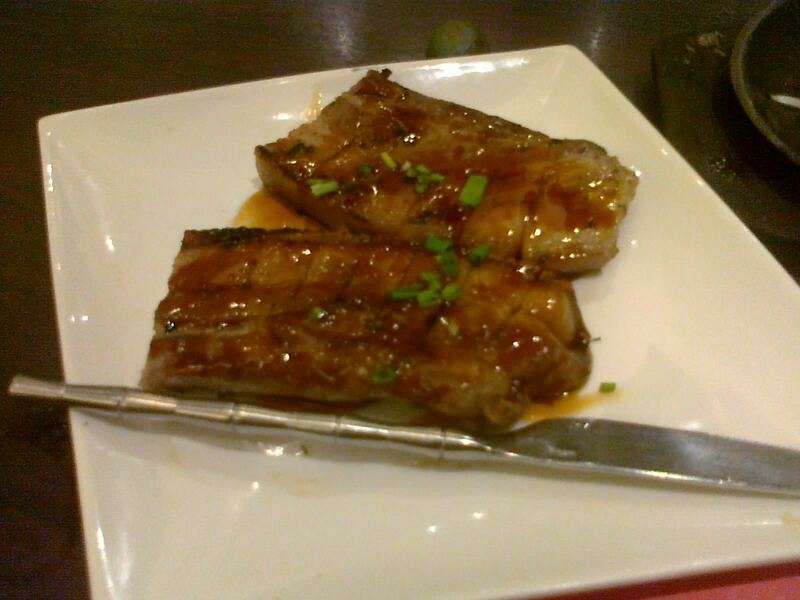 It arrived after a short wait, and there were two generous slabs of grilled pork belly covered in sauce on the plate. I tasted the sauce first, which was excellent—sweet and savory. After having a bite of the pork, it instantly turned to my favorite plate for the night and my favorite grilled pork belly dish next to grilled bacon. The pork wasn’t overcooked, and had a soft, tender texture. In addition to that, it retained the savory and slightly sweet taste of pork that makes it my preferred meat over beef. I do not regret having this extra order at all. Our total bill amounted just a bit over 700 Php. I must say, it’s not bad for four dishes. Two were okay, one was great, and one was excellent and I leave it up to you to learn which is which. We had great variety and didn’t have to pay much, and we might have ate food good for three people. However, their prices and menu items aren’t much different from other bar-and-grills, and there’s plenty of them in Sky Garden. And I’m not really much of a bar-and-grill goer, so I can’t really compare it to others. I guess I need more experience before I can actually rank this one. Nevertheless, Lamesa Grill is an okay place to go to if you want (grilled) Filipino food, and, so far, has set the bar for me in this food genre. Recommended for: Filipino food lovers. Not recommended for: Filipino food haters. Smart nomnomnom tip: Order with variety in mind; dishes are good for two to three.